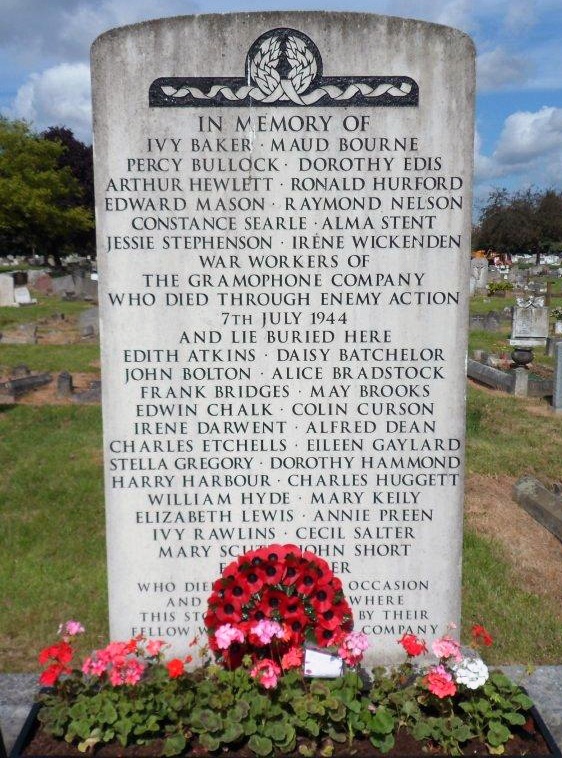 Seventy years today, 7th July 1944, a German V1 rocket landed on the EMI factory in Blyth Road, Hayes, as a result a concrete shelter roof collapsed, killing 34 and injuring a further eighteen. Today we honour the men and women based at the EMI Factory and Hayes, whose contribution was essential to the British War effort, in both civilian and military roles. We particularly remember those who have paid the ultimate sacrifice on that fateful day. A memorial to those killed in the bomb attack on EMI can be found in Cherry Tree Lane Cemetery. Memorial at Cherry Tree Lane Cemetery, Hayes.